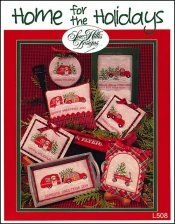 Home For The Holidays [W6773] - $12.00 : Yarn Tree, Your wholesale source for cross stitch supplies. Cross stitch pattern by Sue Hillis Designs. Beep, beep...we are coming "Home for the Holidays!" The station wagon is weighted down with the family packed inside & a Christmas tree on the roof, pulling a camper filled with all the treats & gifts for Christmas in the countryside. A red pickup truck sits at the "Holly Jolly Tree Farm," with it's bed filled with beautiful Christmas trees that have been cut & ready to go to cozy homes. A little red wagon, with a small Christmas tree, sits on the snow covered ground. Don't let these eight beautiful Christmas designs pass you by! Stitch counts: Woody with Camper 92W x 59T, Holly Jolly Tree Farm 84W x 82T, Truck with Tree 61W x 65T, Camper with Trees 68W x 60T, Wagon with Tree 52W x 52T, Woody Only 48W x 19T, Pedal Car 38W x 17T & Wagon Only 38W x 17T. Stitched on #2855 Zweigart Belfast Linen 32ct. Vintage Stormy Night.